Maine Department of Inland Fisheries and Wildlife biologist Kelsey Sullivan shows off a ruffed grouse that was caught in a trap used to study the birds at the midcoast Maine survey site in this September 2014 file photo. 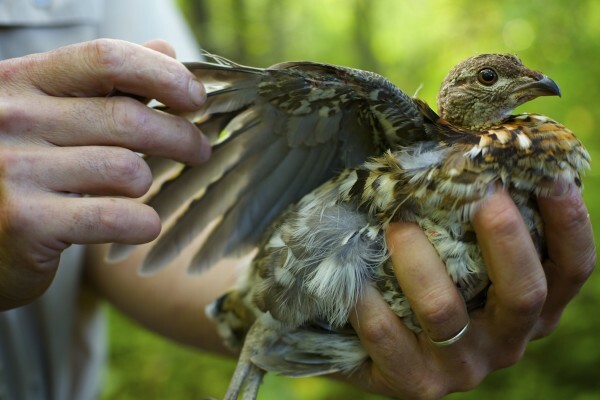 Maine Department of Inland Fisheries and Wildlife biologist Kelsey Sullivan shows the wing of a ruffed grouse that was caught in a trap used to study the birds at the midcoast Maine survey site in this September 2014 file photo. The leaves are still on the trees, and there have been relatively few frosty mornings thus far, but the state’s upland bird hunters will still celebrate their own opening day on Saturday, taking to the woods in their annual October search of ruffed grouse and woodcock. 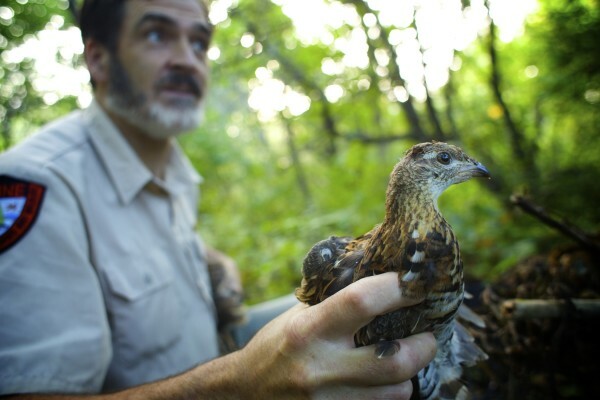 In mid-summer, Sullivan’s colleague, Brad Allen, hinted at a similar prediction based on the relatively few broods of grouse he had been seeing. Sullivan said that when a winter is extremely harsh, birds suffer, but predators also struggle to find food. When a winter is mild, the predators can find food sources (such as grouse) more readily. An average snowfall and average winter temperatures tend to favor the birds. The DIF&W is conducting research and has put radio transmitters on hen grouse to track their mortality through the year. 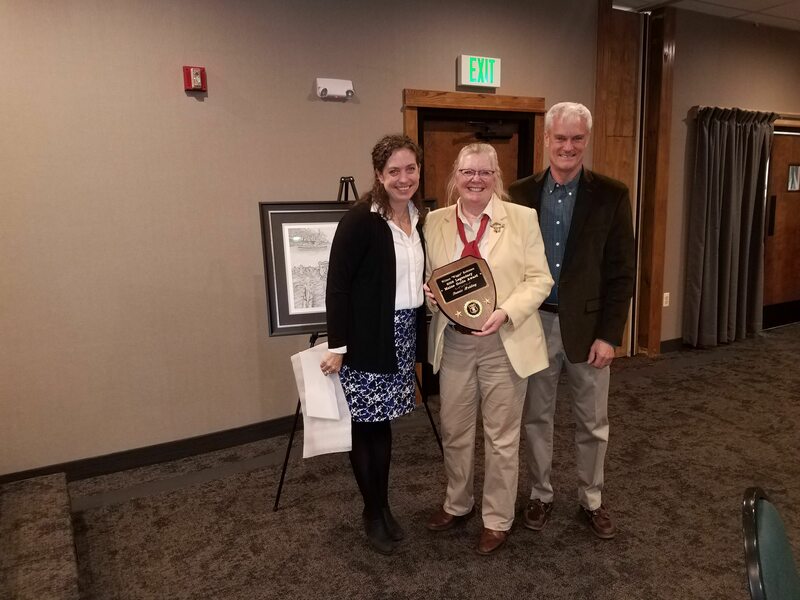 “This past spring, [we learned during the study that] there was higher hen mortality during the nesting season, and even after the eggs hatched and [the hens] were on the ground with chicks, there was higher mortality for those breeding hens,” Sullivan said. During 2014 and 2015, hen mortality during breeding season — largely attributed to predators — was about 30 percent, he said. This year, it was 40 percent. Sullivan said that during those first two years of the study, 45 percent of the grouse died of natural causes each year, and another 15 percent were shot during hunting season. Grouse tend to lay 10 to 12 eggs each, so there are typically plenty of young birds taking the place of those that die. Still, if an additional 10 percent of hens died statewide — as they did in two study areas — that would likely result in hunters having a bit less success. Another resource that helps inform biologists as to the presence of grouse: A survey that moose hunters are asked to fill out when their session of moose season has ended. By compiling the totals from that survey, biologists can track how many grouse are seen or shot, per 100 hours in the woods, by those hunters. Statewide, that number has fluctuated over the years. The 2015 total shows that across the state’s moose hunting territory, hunters saw an average of 43 grouse per 100 hours afield. After the predation that took place last winter, it’s reasonable to expect that this year’s moose hunters will see even fewer grouse. In 2014, moose hunters saw 52 grouse per 100 hours. The number of American woodcock — which hunters also will target during the season — is expected to be healthier, Sullivan said. Woodcock typically nest a couple weeks earlier than grouse, beginning in late April. Sullivan said that each year, biologists count woodcock at “singing grounds” where mating activity begins. That helps them predict how many of the migratory birds might be in Maine at that time. Earlier this year, Allen said that while many hunt grouse while riding roads, woodcock hunting is more attractive to another set of hunters. No matter the abundance of birds this year, Sullivan knows bird hunters will head afield to enjoy the season. And he understands why.